According to legend, Nigihayahi no Mikoto, the founding father of the Mononobe clan, flew from the heaven in this rock ship named “Ama no Iwafune,” glided over the edge of the low mountains extending like a tongue and descended at this place. Iwafune Shrine in Kisaichi, Katano City, Osaka prefecture enshrines the deity Nigihayahi no Mikoto. 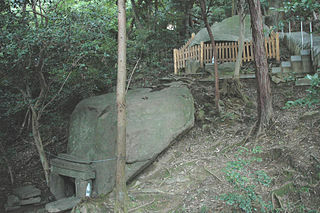 The Goshintai, symbol of divinity, of the shrine is a big rock with a length of 18 m and a height of 12 m, which looks like a ship [hence the word Iwa-fune lit. Rock Ship]. The place where the shrine is located was thought to be Ikaruga-mine or the peak to where the god descended. In front of Goshintai, the Haiden hall (oratory) stands as if it carries the divine rock on its back. In the precinct are a holy rock cave formed by numerous huge rocks and many Buddhist images carved on the rocks. “A kami claimed as ancestor of the Mononobe clan. According to Nihongi, Nigihayayi descended from heaven in the “heavenly rock boat,” took for wife Mikashigiyahime (younger sister of Nagasunehiko), and thus fathered Umashimade no mikoto. The account in Kojiki is similar, except that Nigihayahi is described as marrying Tomiyahime, younger sister of Tomibiko, and thus fathering Umashimade. 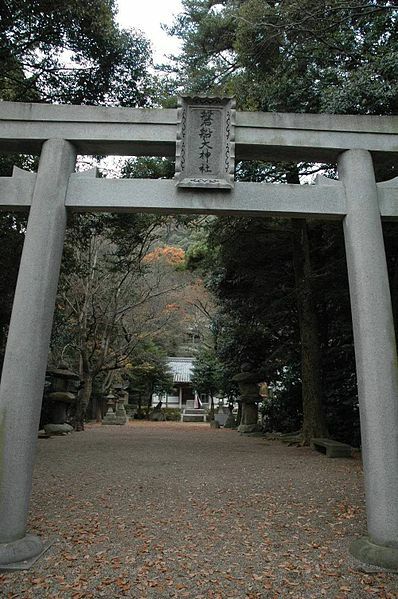 Iwafune Shrine (Iwafune Jinja) is also known as the guardian god of safe navigation. Another story about this rock is that Kato Kiyomasa once tried to move this rock to use as the material for stone walls of Osaka Castle, but he couldn’t and gave it up.